Residents who were holed up in their homes let out cheers after it was confirmed that Dzhokhar Tsarnaev had been apprehended. NBC's Ron Allen reports. Onlookers erupted in spontaneous applause and cheers Friday night as news spread that the second suspect in this week's Boston Marathon bombing had been taken alive — gratitude that quickly spread across the U.S.
Clapping crowds turned Watertown, Mass., into a virtual parade route, lining the streets as police vehicles slowly drove away from the scene where Dzhokhar Tsarnaev, 19, was arrested after an hours-long standoff — wounded and bleeding but alive. "Thank you!" many of them cheered, and "BPD!" in honor of the Boston Police Department. Law enforcement officers sporting big smiles joined in the clapping and cheering. One officer acknowledged the crowds by responding over the loudspeaker: "It was a pleasure!" 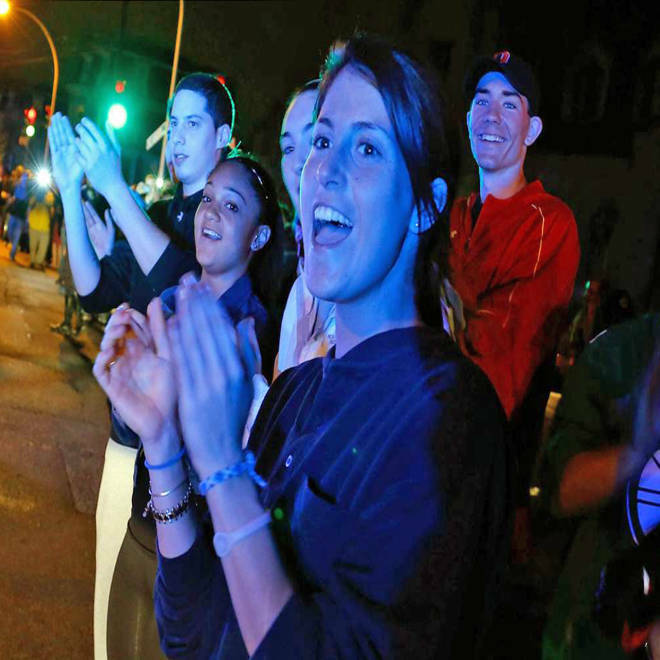 Specators cheer police in Watertown, Mass., after the second suspect in the Boston Marathon bombings was apprehended. Shouts of "Yeah, Boston!" rang out in Boston's Copley Square. In some parts of the city, crowds broke out singing the Neil Diamond song "Sweet Caroline," a tradition at Red Sox games. Across the U.S., cheers erupted anywhere large crowds of people were gathered. At Citi Field in New York, where the Mets were playing the Washington Nationals, the crowd began chanting "U-S-A! U-S-A!" when the scoreboard operator put up the message "All New Yorkers support the Boston Police Department." People on the streets of Philadelphia did the same. The crowd at the Texas Rangers' game against the Seattle Mariners in Arlington, Texas, also sang "Sweet Caroline" when the scoreboard flashed "Suspect alive and in custody." At Reagan National Airport in the Virginia suburbs of Washington, people began cheering in the terminal. The same happened at the Tampa, Fla., airport, where passengers lining up for a JetBlue flight to Boston gasped and then began applauding as they got word of the arrest, The Boston Globe reported. And in Winston-Salem, N.C., officials announced Friday night that a "Run for Boston" benefit race was being organized for Monday, NBC station WXII-TV reported. Ron Allen, Lou DuBois, Lester Holt, Jennifer Long, Luke Russert, Anne Thompson and Tom Winter of NBC News contributed to this report. Who are the brother Boston bombing suspects?